Every person’s skin is unique and subject to a wide range of genetic and environmental factors that can affect skin health and appearance. Before deciding how to treat skin problems, we must first understand each patient’s individual complexion makeup. That’s why we offer every dermatology patient a comprehensive VISIA™ skin care analysis. VISIA™ complexion analysis is a sophisticated tool that allows us to objectively measure each patient’s individual skin characteristics. This scientific analysis influences our treatment approach on two fronts. First, it allows us to design a truly customized treatment plan that takes into consideration problems both on and below the surface of the skin. Second, it provides a baseline snapshot which, when compared against subsequent analyses, will allow us to see the great improvements we have made. How does VISIA™ skin care analysis work? What should I expect during VISIA™ skin care analysis? 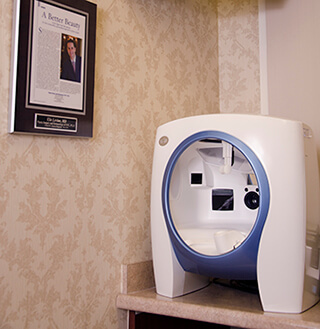 VISIA™ skin care analysis is performed in our offices using specialized digital photography technology. The procedure takes just minutes to complete. * Dr. Levine will analyze the results and meet with you for a personal consultation to discuss your skin care concerns and design a treatment plan for your specific needs. How can I find out more about VISIA™ skin care analysis? Dr. Levine will be happy to meet with you to discuss VISIA™ skin care analysis. Please call our office at 212-988-1800, or make an appointment online for a personal consultation in our New York City offices.